Et Verbum: The Life Of Saint Monica By F.A. Forbes part. 7. 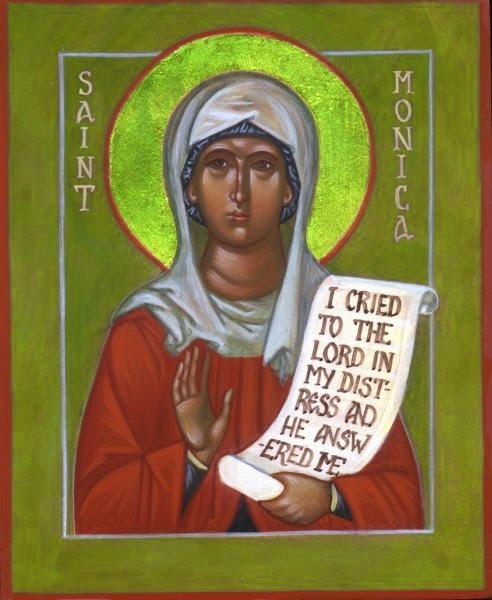 The Life Of Saint Monica By F.A. Forbes part. 7. Ill news travels fast. Augustine had scarcely joined the Manicheans before the tidings reached Monica. At first she could hardly believe it. This was a blow for which she had not been prepared; it crushed her to the earth. She would have grieved less over the news of her son's death. And yet she bent her broken heart to God's will, and hoped on in Him "Whose Mercy cannot fail." Augustine had renounced the Faith of his childhood publicly, she heard later; he had been entered by the Manicheans as an "auditor," the first degree of initiation in their sect. And with all the zeal and ardour that he carried into everything he did he was advocating this abominable heresy and persuading his companions to follow his example. Her eyes grew dim with weeping for her son. He was dead indeed to God—that God who was her All in All. The vacation was near, and Augustine would then return to Tagaste. Perhaps she would find that it was not so bad as she had thought. It might be only the whim of a moment; she would wait and see. Alas! the hope was vain. Augustine had scarcely been a day at home before he began obstinately to air his new opinions, determined that she should listen. Then the Christian in Monica rose above the mother; her horror of heresy was for the moment stronger than her love for her son. Standing before him, outraged and indignant, she told him plainly that if he spoke in such a way she could no longer receive him at her table or in her house. Augustine was amazed; he had found out at last the limits of his mother's endurance. With bent head he left the house and sought the hospitality of Romanianus. No sooner had he gone than Monica's heart melted, the mother-love surged up again. With bitter tears she cried on God to help her; her grief seemed greater than she could bear. At last the night came, and with it peace. As she slept, exhausted with weeping, she had a dream which brought her a strange sense of hope and comfort. It seemed to her that she was standing on a narrow rule or plank of wood, her heart weighed down with sorrow as it had been all through the day. Suddenly there came towards her a young man radiant and fair of face. Smiling at her, he asked the cause of her tears. "I am weeping," she answered, "for the loss of my son." "Grieve no more, then," he replied, "for, look, your son is standing there beside you." Monica turned her head. It was true; Augustine stood at her side on the plank of wood. "Be of good cheer," continued the stranger, "for where you are there shall he be also." Then Monica awoke; the words were ringing in her ears; it seemed to her that God had spoken. In the morning she went straight to Augustine and told him of her dream. "Perhaps," suggested her son, anxious to turn it to his own advantage, "it means that you will come to see things as I do." "No," said Monica firmly, "for he did not say, 'Where he is you shall be,' but, 'Where you are there he shall be.'" Augustine was even more struck by the earnestness of his mother's answer than by the dream itself, though he pretended to make light of both. Not long after Monica went to see a certain holy Bishop, that she might beg him to use his influence with Augustine to bring him back to the truth. The wise old man listened attentively to her story. "Let him alone for the present, but pray much," was his advice, "for as yet he is obstinate and puffed up with these new ideas. If what you tell me of your son is true, he will read for himself, and will find out his error." Then, seeing the anguish of the poor mother, he told her that he himself in his youth had been led away by the Manicheans, and had even been employed in transcribing their works. It was that which had saved him; for, as he wrote, the truth became clear to him; he had seen how much their doctrines were to be avoided. Then, as Monica wept for disappointment—for she had counted greatly on his help—a sudden pity seized him. "Go thy ways, and God bless thee," he cried. "It is impossible that a son of such tears should perish." Monica's dream and the words of the Bishop were like rays of light in the darkness. She drew fresh hope from them and redoubled her prayers. The vacation drew to an end, and Augustine returned to Carthage, but not for long. He was now twenty years old. His friend and patron, Romanianus, was very anxious that he should open a school in Tagaste while waiting for something better, and this he resolved to do. A little circle of pupils soon gathered round him, who were later to follow their young master in all his wanderings. Amongst these was Alypius, an old schoolfellow and a devoted friend; the sons of Romanianus; and another friend of Augustine's childhood whose name we do not know, but who was dearer to him than all the rest. They were of the same age, had studied together, had the same tastes, and the same ambitions. Influenced by Augustine, still warm in the praise of the Manicheans, he, as well as the rest, had abjured the Catholic faith to join their heresy. Augustine had been about a year at Tagaste when this friend was taken suddenly ill. He lay unconscious in a burning fever; there seemed to be no hope of recovery. He had been a catechumen before he had joined the Manicheans. His parents, who were Christians, having begged that he might be baptized before he died, the life-giving waters were poured on him as he lay between life and death. Augustine made no protest, so sure was he that what he himself had taught him before he was taken ill would have more influence than a rite administered without his knowledge or consent. To everybody's surprise the young man recovered his senses and began to mend. Augustine then laughingly told him what they had been doing, and went on to make fun of the whole proceeding, never doubting but that the sick man would enjoy the joke as much as he did. To his great surprise his friend turned from him in horror. "Never speak to me in such a way again if you wish to keep my affection," he said. "We will talk this matter out when you are stronger," thought Augustine. But a few days later the invalid had a relapse, and died with the white robe of his Baptism still unstained. Augustine was inconsolable. Everything in Tagaste reminded him of the dear companion of his boyhood. "My own country became a punishment to me," he writes, "and my father's house a misery, and all places or things in which I had communicated with him were turned into a bitter torment to me, being now without him. My eyes sought him everywhere, and I hated all things because they had him not." The thought of death was full of horror to him, and he gave way to a deep depression. His health, never very robust, began to suffer. Romanianus, much as he wished to keep him at Tagaste, realized that a change of scene would be the best thing for him, and agreed to his proposal to return to Carthage and open a school of rhetoric. Alypius and his other disciples followed him, and in the rush of the great city Augustine regained, to some extent, his peace of mind. While teaching, he continued his own studies, and competed for the public prizes. Many men of note joined his school, and his name began to be famous. He greatly desired honour, he tells us, but only if honourably won. One day a certain magician paid him a visit. He had heard, he said, that Augustine was about to compete for one of the State prizes in rhetoric. What would he be ready to give if he could insure him the victory? It was only necessary to offer some living creatures in sacrifice to the demons whom he worshipped and success would be certain. Augustine turned from him in horror and disgust. He had not yet fallen so low as this. "I would not sacrifice a fly," he retorted hotly, "to win a crown of gold!" The magician retired in haste, and Augustine, who succeeded in carrying off the prize without the help of the demons, was publicly crowned by the Pro-Consul Vindicius, who from thenceforth joined the circle of his friends. The news of his success reached Monica. Her mother's heart rejoiced in his triumph, but her joy was tempered with sorrow. Carthage had taken more from her son than it could ever give him, and her thoughts were of other victories and other crowns. During his stay in Tagaste, although Augustine had not lived under the same roof with his mother, he had been continually with her. Her tender affection had been his greatest comfort in the deep sorrow after his friend's death. He spoke no more to her of religion, and she, mindful of the old Bishop's words, was also silent. "While I was struggling in the mire and in the darkness of error," writes Augustine, "that holy, chaste, devout, and sober widow (such as Thou lovest) ceased not in all the hours of her prayers to bewail me in Thy sight. And her prayers were admitted into Thy Presence, and yet Thou sufferedest me to go on still, and to be involved in that darkness." The darkness was indeed great, but the fires were still smouldering beneath the ashes. Love, honour, and success were all his, and yet he was not content. There was something in his soul that none of these things could satisfy. "After Thee, O Truth," he cries, "I hungered and thirsted!" His heart still ached for the loss of his friend, he turned everywhere for comfort and found none. He sought forgetfulness in study. He wrote two books on the "Beautiful" and the "Apt," and dedicated them to Hierus, a famous Roman orator. "It seemed to me a great thing," he tells us, "that my style and my studies should be known to such a man." Monica drew fresh hope from her son's writings. They were full of noble thoughts and high aspirations. Such a mind could not remain in error. Some day, surely, in God's good time, he would come to know the truth.